Paul Normandale needed a cost effective LED light, something simple but bright, for the 2011 Chemical Brothers tour and Martin Professional’s tiny yet powerful MAC 101 LED moving head fit the bill. As part of Normandale’s uniquely creative design for the British electronic duo, he placed 56 of the remarkably small and versatile LED wash lights behind a transparent LED screen and then used them to project pixel mapped video effects through it. Mounted in four rows of 14 fixtures each, the 101s are pixelmapped to three songs and used for overall impact and general lighting purposes during other parts of the show. With latency between video and moving heads a major concern, the MAC 101s have had no problem keeping up with the video imagery, Normandale says. Weighing in at just 3.7 kg and surprisingly powerful for such a small fixture – it punches out up to 2200 lumens - the MAC 101 is Martin’s fastest moving head ever with a feature set that includes a calibrated RGB color mixing system. Its small size not only makes it easy to fit in any rig or set, it also makes it exceptionally easy to handle. Normandale’s lighting needs didn’t end there however. Rigged between the 101s for flashy blasts are Martin Atomic 3000™ strobes, which, Normandale says, are also mapped to coincide with the video. Requiring a bright hard-edge light for big dramatic effects he turned to Martin’s high-output MAC III Profile, which he has positioned on a rear moving truss and on the floor. For colorful wash effects Normandale uses Martin’s powerful MAC 2000 Wash XB. Providing “a lot of smoke” according to Normandale was two Jem ZR44 Hi-Mass™ foggers, Martin’s powerful atmospheric fog generator capable of kicking out a massive 1200 cubic meters of dense fog per minute. Sufficiently rugged and continuously operational with a large 9.5 liter fluid container, it can operate for long periods without refilling. 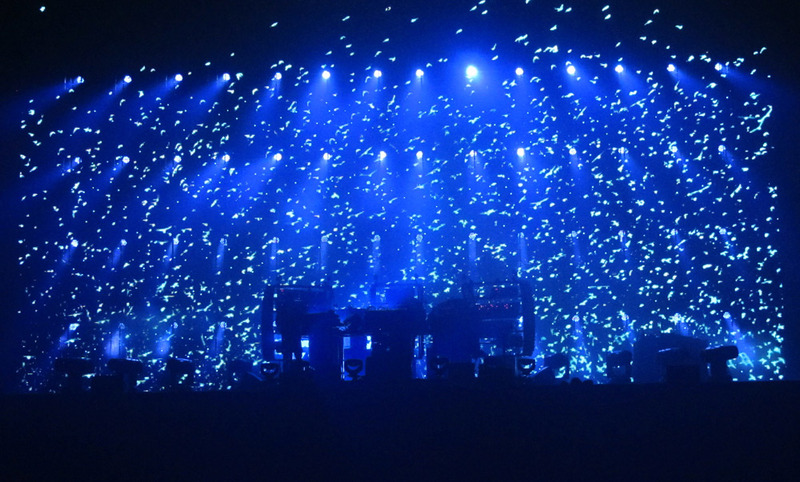 Lighting supply for the Chemical Brothers tour is by Normandale’s lighting production company Lite Alternative.